In the early 1950’s there were only one kind of Christmas lights used to light up a Christmas tree. A string of low wattage light bulbs painted red, blue, green and yellow. Ah, the good old days…. 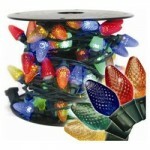 Today, there are many different kinds of lights to choose from, in a wide variety of colors, too. With the advancement of technology your holiday present of Christmas lights will be a present that lasts for many years to come. In addition to decorating the inside of your friend’s or loved one’s home, there are many options for exterior lights as well. Not only can you give exterior lights for the home, but you can also get any number of lawn animals, nativity scenes or sleighs with reindeer in a wide variety of lights and colors. To Blink? Or Not to Blink? Depending upon where you want your lights to be displayed, it’s important to keep in mind the overall ambiance created by lights that blink compared to lights that do not blink. When considering purchasing lights as holiday presents, blinking lights may work well for the Christmas tree, or for exterior lights, but for the garland lights for the stairway a non-blinking light works best. Of course, there are the bubble lights available too. Very pretty lights, although they do make some noise. There are a number of online stores which carry such items that also offer discounted shipping rates. Some other things to consider when getting lights for holiday presents are the ancillary items that come with lights. Consider purchasing green stringed lights for the Christmas tree, but white color stringed lights for the mantle. It’s a good idea to include extension cords in various lengths, light clips, extra bulbs and of course, don’t forget the appropriately sized box for storing.